Wired ribbons, fabric strips, or burlap ribbon wraps quickly and easily around a wire wreath form to make an indoor fall wreath that reflects your style! I’ve been wanting to make a fun bright Autumn wreath for inside my house. I have the perfect place to hang it, where I’ll see it every day and it will brighten up my home. This year I really wanted to try something different with my Autumn and Thanksgiving decorations. Many of the decorations I’ve used for years are worn and dark so with the purchase of three rolls of Mesh ribbon and a wire wreath form (from the dollar store!) and a few extra silk flowers and leaves left over from my Fun Fall Fabric Pumpkins I spent a total of $5.00 on this project! The great thing about this wreath is that it can be made with any ribbon or fabric strips of your choosing. The frame is wire and constructed in a way to weave ribbon in and out of the circles. It goes quick and the ribbon could easily be taken off and reused if you decide to try a different look next year! You can find a variety of ribbons of all sorts at craft and fabric stores which sell the wire frames as well. I would recommend using a double sided ribbon since you’ll be twisting and turning and won’t want to see the back side of an unfinished ribbon. If you choose to use fabric strips, you could try either folding the strips in half lengthwise and pressing, or try using fusible hem stitch tape to fuse the wrong sides of two equal-width fabric strips together. There are also pretty burlap ribbons that would make a nice “farmhouse” style wreath! I chose to use three different colors of my mesh ribbon but one color would be fine and would make it even easier to weave. NOTE: The front of the wreath is the (outward facing) part that curves outward/convex. The back of the wreath is curved inward/concave. Decide whether you plan to weave all the way around the wreath with your ribbon. 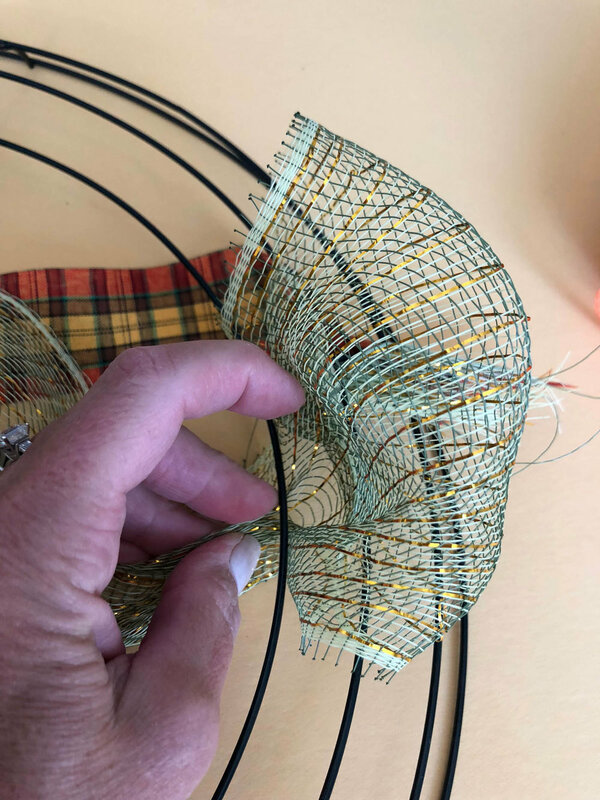 If you plan to embellish with other items like I did you’ll want to keep that in mind as you weave, and you’ll want to stop at one of the center wires to tie off. Begin by weaving in your first piece of ribbon and tying to one of the center wires. If using a second or third color as I did, tie those on also, spacing them out slightly from the first ribbon. Loop the ribbon up and over the first rung making a loop (about 3-4”) and then turn the ribbon to twist before you bring it back over the next rung. This is important because without the twist of the ribbon it won’t have the same fullness. Weave your first color through a few times and then begin weaving in your next color(s). Hold each loop in firmly to hold the loops in place as you work. You want to pack your loops in pretty tightly. When you are all the way around the wreath or at your stopping point, tie off the ribbon and hide the knot on the back. If adding embellishments as I did, use small pieces of floral wire to attach them to the wreath form. Fill in as much as you like. Finally, I used a different and contrasting ribbon to hang the wreath on my door, but if you have a wreath hanger or hook you can hang it that way, too. I love the bright mesh ribbon I chose with the contrast of the plaid ribbon hanger and traditional fall leaves and flowers but the fun of this project is that you can customize it any way you like. We call that Creative Freedom and that’s what I’m all about! Be sure to take a look at my other Autumn projects, How to Make Fast & Fun Fabric Pumpkins, and Fabulous Fall Wreath How To. I’d love to hear from you and see photos of your ribbon choices! Feel free to comment below or send me an email!